The 4th of July is right around the corner. It’s time to celebrate America’s birthday! And, what better way to celebrate than with picnics and fireworks? But, we all need to remember to be very careful with fireworks. We here at United Medevac Solutions want you to have a fun and safe holiday. We don’t want to see you in the many healthcare facilities that we staff because you’ve had an accident. (We would much rather you simply stop in and say, “Hello.”) So, let’s remind ourselves of some firework safety tips. These are all tips that we have probably heard before, but they are certainly worth repeating. Is Your Healthcare Facility Staffed Appropriately For The 4th Of July? We Can Help! Obey all local laws regarding the use of fireworks. 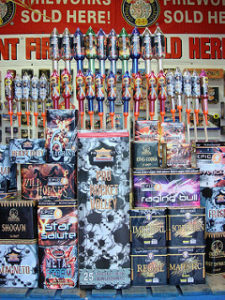 Many areas won’t allow the use of personal fireworks within city limits, for example. Light one firework at a time and then move away quickly. The “move away quickly” part people tend to remember. However, how many times have you seen your buddy want to create his own firework show “grand finale” and light several at a time? This is not a safe practice and should not be done. Never relight a “dud” firework. Wait 20 minutes and then soak it in a bucket of water. Please don’t try to save a buck by relighting a firework that doesn’t work. It’s not worth the pain and suffering that could occur if it does work when you aren’t expecting it. Please take the time to ensure that it is extinguished properly. We hope you have a fantastic Independence Day celebrated with family and friends. We hope you enjoy great food, fun, and laughter. We even hope you enjoy a spectacular firework display! However, we want you to please be safe while you celebrate. Please review all the safety tips prior to beginning your celebration. Another option: pack a picnic dinner, grab your family and friends, and head out to a city-wide celebration (and leave the firework displays to the experts).